She brought her cat in from the outside. She was an older woman who had lived in the tenement in the Bronx for as many years as she could remember. She had a number of cats inside the house already. But no one could say it was too many cats, because if you did not see them, you might not know they were there. Each was a shadow or a whisper seen just out of the corner of your eye and would sometimes disappear when you turned to see them. Each was a picture of perfection when they deigned to come over to you, fur shining, teeth glittering in the candlelight. Sometimes you could pick one up and marvel at its lithe and muscular nature, the ever gentle scent of mint that rose from their fur. 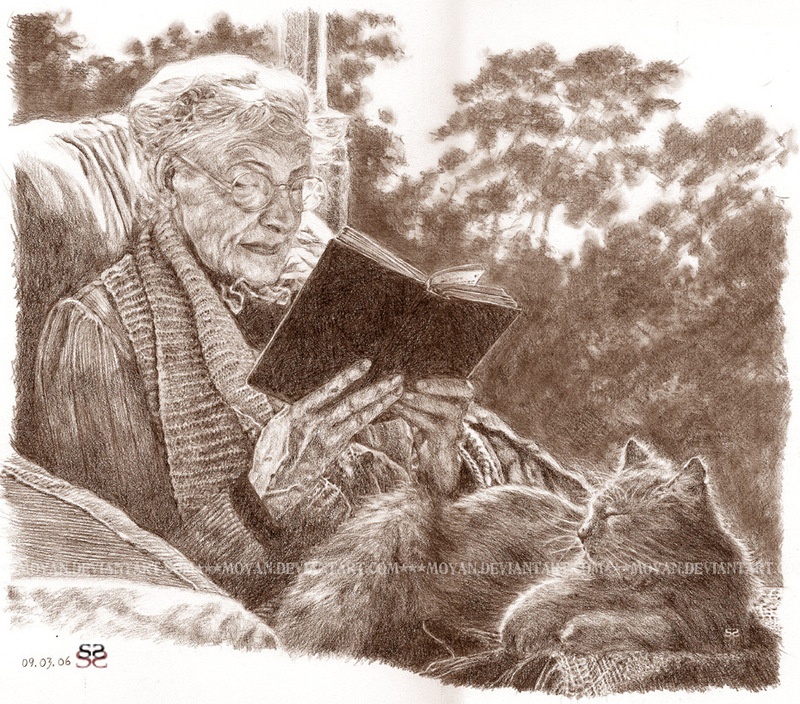 Sabra was different than other old cat ladies in a number of ways. She did not appear to be as crazy as most. Yes, she wore the typical old lady clothes, stuff from a century earlier than this one. You never quite recognized any of it, but you knew it wasn’t fashionable any time recently. It did not stop it from being somehow appropriate for her and she wore it with a type comfort unseen with today’s plastic, polyester, over the top clothing which may be perfect for the time but no one would remember it a year or two from now and no one would ever admit to ever having worn it. No, her clothing was timelessly beautiful, just like she was. Her face appeared to be that of an old woman with warm lines whenever she smiled a you, laughing lines around her eyes and while her cheeks had narrowed, they were once full and soft, and had a curve that enticed you to approach her neck and just sit there, near her perfect ears and long, dark hair, now white, but still long and strangely luxurious. And while she appeared to be a woman in her late sixties or early seventies, her stride was only occasionally one of a woman whose body was in it golden years. Most of the time, you might see the shadow of another, younger, more vibrant woman and wonder what she might have been like in her youth. Sabra was certainly a mystery to everyone who saw her, because you could only seem to see her as a collective. If you focused on any single thing, the way we just did, you might notice more than you were supposed to and that might be bad for you. Sabra’s neighbors had learned to ignore the peculiar old woman who might talk to herself as she trundled up the stairs with cans of cat food and vegetables. She would let the young men in the rough neighborhood carry her bags upstairs but none were ever rough or rude to her. There was something about her that let you know she would not tolerate poor manners. Very few people could remember a time when she did not live here, but no one could tell you when she moved into the neighborhood. It was a strange thing among a number of strange things that did not make sense, but everyone accepted. Bad men, drug dealers, killers, and pedophiles would wander into this part of the Bronx, because it was a nexus of social activity, and peddle their wares, but this was not done often after Sabra became a member of the neighborhood. These men would disappear after they met her a few times returning from her errands. The neighbors noticed this but said nothing. These men were not of the family, or of the people or of our people. They were other and Sabra warned them. She always did. If they did not take the warning and leave, the locals would shake their heads, mutter under their breaths about the diminished quality of the neighborhood and wait for the Song. At first, people wondered where Sabra collected her cats because there were never any strays on the streets in this part of the city. At night, you would see a few of them, but you always knew they were her cats, clean, quiet, well mannered like her. People tolerated them and in return, there were no mice in shops or apartments, and no rats would dare to grace a trashcan for blocks in any direction of Sabra’s apartment. Stores she frequented also enjoyed that blessing. After a few years, her cats, became invisible to the locals, a part of the landscape, welcomed and yet ignored. There was never a time this collection of cats was ever a menace to the neighborhood, nor did they stay up late at night singing and disturbing the neighbors. They might be out, and they might be singing, but their song was a different one. One that soothed, one that protected, one that said, don’t notice us, there is nothing to see here. If you are hearing us, you are happy, you are one of us, you love our song, and if you are not, you don’t want to be here. People who didn’t belong here who heard that song and were on the wrong side of it, were never found again. Sabra would pick up her new cat in the morning, instinct brought it to her, confused, it would run toward the beacon it could see in the night. Clamber in through the broken window in the basement, climb the three flights of stairs in the old building, and wait at her door. She never recognized these new cats, but could feel its confusion about its new, simpler, life. She would bring it in, give it food, get it adjusted to its new home and its new brethren and she would go out to make sure her neighborhood was the way she left it when she went to bed. The warm sun would always bring a smile to her face and make her think of a place far away, lost both in time and space. Then that memory would fade and she would tuck her scarf into her jacket and mutter incoherently. From the fire escape, one black cat would watch for her, prowling rooftops keeping her in his sight and safe for another day. He had done that job for decades and took it very seriously. She cannot remember who she is. Not yet. The time is not right. The Aspect War © Thaddeus Howze, 2012, All Rights Reserved.